¶ The U.S. Playing Card/Russell & Morgan one came, just as the box states, with 1-3/8" plain clay poker chips. They were mint. But the printing on the box indicates that they should all be white, while the box came with red, white and blue chips ...... .... ...... The box must have been made between 1885 and 1891. Russell & Morgan Printing Co. was formed in 1885. 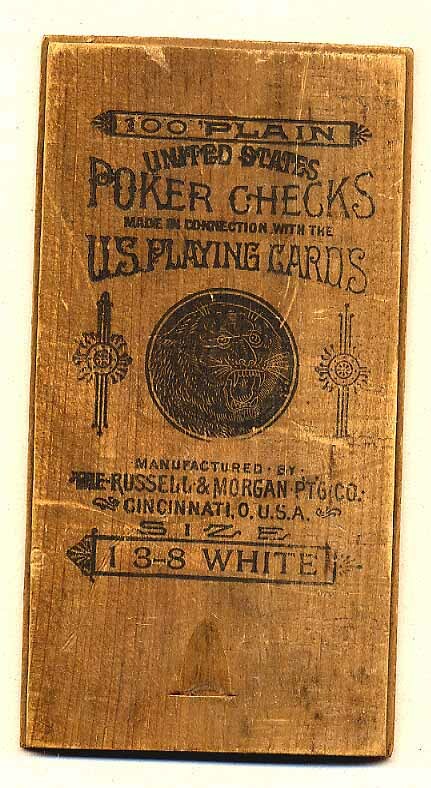 The name was changed to U. S. Printing Co. in 1891 and eventually to U. S. Playing Card Co. in 1894. For half a century, ending just after World War II, it was a major gambling chip manufacturer. ¶ The "Ivoroyd" box has the paper label on the end, no printing on the top, and came with all white 1-1/4" plain clay chips. I suppose the reference is to durability and quality. 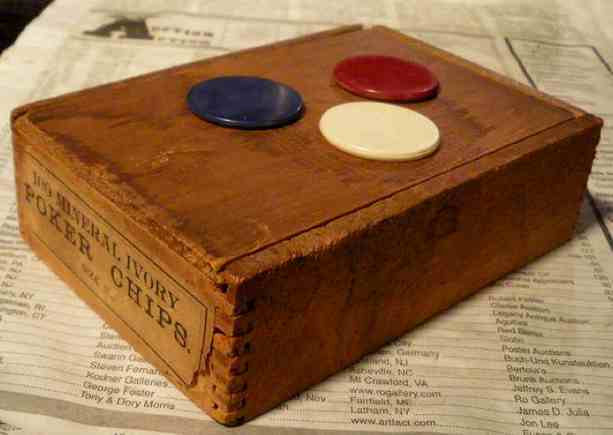 Harris, one of the earliest (c. 1900) chip manufactures, located in Brooklyn, by the way, had on their boxes of engraved red, white and blue poker chips "INDESTRUCTIBLE IVORYOID." 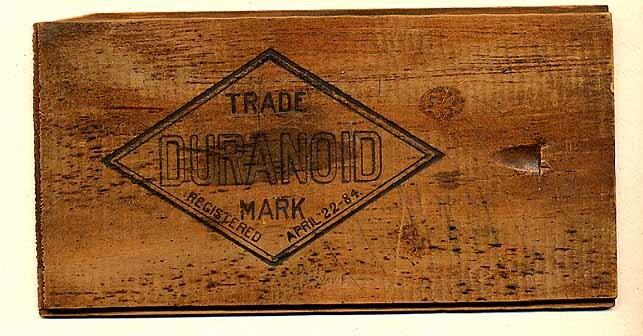 ¶ The Duranoid box says "registered April 22-84." In it came 100 red, white and blue 1-1/2" plain clay poker chips. Mineral Ivory Poker Chips. I saw the above box on eBay Dec. 2009. 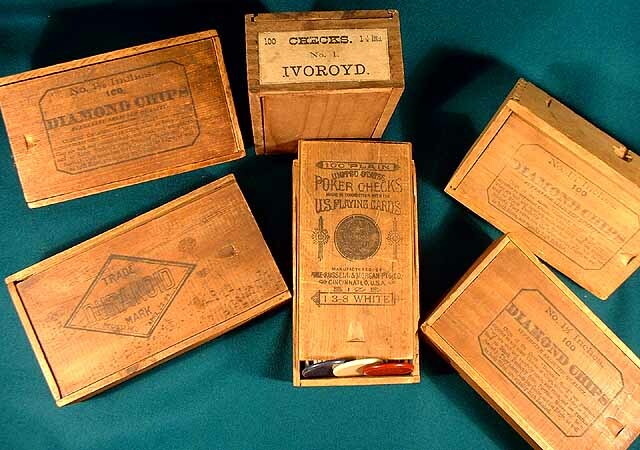 Ivory poker chips preceded clay composition chips, which weren't invented till the late 19th century. Ivory chips were also quite expensive. 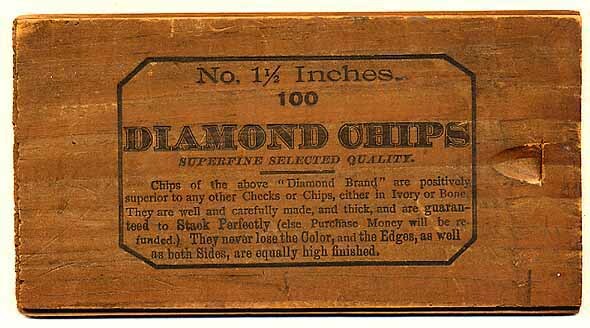 So apparently the new chips were called "mineral ivory" by at least one manufacturer. 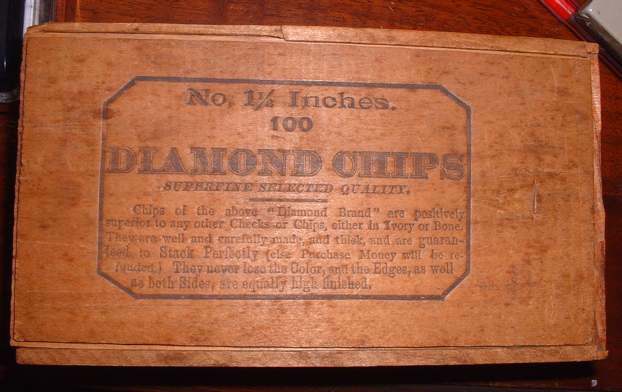 The seller describes the set as, "Chips measures 1-1/4" diam. They resemble bakelite, but are actually made of clay, I believe. In original dovetailed (or "finger-joint" to be exact) wooden box with slide top, measuring 3-3/4" X 5-1/2" X 1-5/8" high. End label says "100 MINERAL IVORY POKER CHIPS, SIZE 1-1/4". However, there actually are 118 (59 white, 29 blue and 30 red)."